Confession: I adore carbohydrates. Pasta, bread, rice, cereal, potatoes, corn, etc. If it has a carb, it is going in my mouth. Sad news for carb-lovers: one of the trendiest diets now, as it has been for years, is the low-carb/no-carb diet. Also annoyingly trendy? Gluten-free. Now, first let me say this: if you do have Celiac disease or an actual gluten-sensitivity…then PLEASE stay away from gluten. I cannot imagine the pain you go through trying to digest something your body thinks is poison. But this post is still for you – because there are a lot of carbs out there that are gluten-free! First, let me debunk some myths. Myth: No human can sufficiently digest gluten. Truth: 1% of Americans actually have Celiac disease. That is 1 out of 133 people. Only 5% to 10% of Americans have a form of gluten-sensitivity. The other 90% are just following a fad. The other 90% can digest gluten just fine and have simply fallen into this belief that “gluten” is going to kill us all. But here’s the thing about gluten. It’s a protein. You know. That macro-nutrient that we are all trying to get more of in our diets. It is one of the reasons ancient people ate bread-like foods. Because grains are a decent source of non-animal protein. In fact, the first supposed instance of wheat (the major source of gluten) being used is 9,000 BC in modern day Turkey. We’ve been digesting gluten for over 11,000 years. I think we’ll be okay if we keep eating it. Truth: Any smart Celiac suffer will tell you you’re wrong. The major gluten offenders of the grain world are wheat, rye, and barely. But there are many grains that are perfectly safe forms of carbs and protein: corn, rice, millet, amaranth, teff, sorghum, quinoa, and sometimes oats (but make sure the oats are certified gluten-free…they like to sneak gluten in while processing). Not to mention potatoes! The best news is that most of these grains are as easy to cook as rice AND many of them make very successful loaves of bread. Myth: Carbs make people fat. Convert quickly to energy AND store up for future energy. The glucose in carbs converts very well into ATP (the stuff cells need for energy). Without carbs, your body will use all that protein you’re eating for energy. Sounds good in theory, right? Wrong. If your body is using protein for energy…it ISN’T using it to build lean, healthy muscle. And that’s something we could all use more of. Help keep you regular. Carbs (good carbs) have tons of fiber. And fiber keeps you happy. Enough said. According to the Mayo clinic, carbs can also protect you against cardiovascular diseases and other bad things. Cool. Now, am I telling you to fill your plate three times a day with pasta and call it dandy? No! I’m very well aware that there are “good carbs” and “bad carbs” and that moderation is key. And I do believe that very much. Nothing in this next sentence will be anything new: eat whole grains! If it is made of flour and it is white, just say no! We’ve heard this recommendation for quite a while now. We’ve also heard all the recommendations about when you should or shouldn’t eat carbs (never for dinner!) and how much a serving should or shouldn’t be (it should fit in your hand!) and blah blah blah. Blah. Let’s get real and infuse a little “Real World Healthy” into this conversation. First, I have a few confessions about my own relationships with carbs. I. Love. Carbs. And no matter what all the health professionals say, I am not satisfied with a meal any time of the day if it doesn’t include a carbohydrate. I am okay with that. If I don’t eat carbs, I don’t have friends. I am happy to eat whole wheat bread and experiment with various grains. But I strongly dislike brown rice and I refuse to eat whole wheat pasta. If given the opportunity, I could eat bowls or cereal and/or pasta for every meal for the rest of my life. Now. Since I’m doing a pretty good job of being a carb-o-vore and not packing on a hundred pounds a year…how about some of my tips and tricks to living a carb-full and carb-happy life. Mix it up! I try to have a variety of different carbs every day. Example: if I have toast with breakfast, I try not to have a sandwich for lunch. It’s a pretty simple way to make sure I get a variety of grains and nutrients (and not go through a loaf of bread in four days). One carb per meal. When I was younger, my favorite school lunch was anytime I got bread to dip in my mashed potatoes. Yum! These days, I do my best to make sure I only have one carb in every meal. Yes, this typically means no garlic bread with my pasta, no french fries with my hamburger, and no mashed potato sandwich. It is really a very tiny and easy sacrifice that helps ensure I keep my carb-munching in check. Measure your pasta! Pasta is the easiest food to eat too much of (much like peanut butter…). I always, always, always weigh my pasta. If the pasta is the main food item in the meal (like spaghetti or mac and cheese), I will measure 4 oz per person. If I’m making a pasta side-dish, it is 2 oz per person. My scale is a life-saver when it comes to pasta. Left to my own devices…I could easily eat a whole pound bag. Eat what you like! If, like me, you hate brown rice and continually force yourself to eat it…you will forever be craving huge bowls of white rice. And you know what will happen if you ever get that bowl of rice in front of you. So, go ahead. Eat the white rice. Just be mindful of the amount you’re eating and, most importantly, don’t beat yourself up for eating it! Get moving! Like I said earlier, carbs are the building block of cellular and physical energy. So…if you eat a giant bowl of pasta one night (we all do it sometimes! )…maybe don’t go to sleep right afterwards. Get up and go for a walk, go biking if your neighborhood/city is good for it, or even just clean the dishes and give the house a quick pick up. Even a little bit of that energy used up will be good for you! Today, I became a statistic. I joined the 3% of Seattlites who bike to work. A mere 3%, you say? Believe it or not – Seattle has one of the highest bike commuter rates in the whole country! Based on our estimated population, nearly 18,624 people ride their bikes to work in Seattle. Clearly, we who live in this absurdly hilly city are gluttons for punishment. Aside from my slight masochistic tendencies, I chose to become a bike commuter for many reasons. First, to save money. According to sciencey people who do research, you can save around 50 cents a mile by riding your bike to work instead of driving. Since my commute by car was 6.5 miles each way, I’m saving $6.50 every day. That’s $32.50 every week…or roughly $1600 a year (give and take a few holidays). I don’t know if that’s true…but my bank account will be one happy camper if it is! Secondly, I chose to become a bike commuter because I adore riding my bike and I live in one of the most beautiful places in the country. 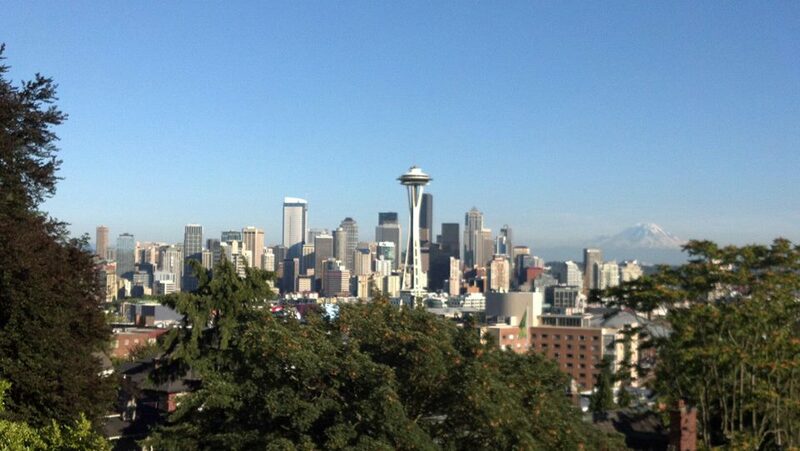 Seattle is lined on one side by the Puget Sound/Elliot Bay and is surrounded on all sides by mountains. And on a clear day, I can see Mount Rainier reigning over the landscape. A morning (and afternoon) bike ride is food for the soul around here. My third reason for becoming a bike commuter, and the one that relates directly to this blog, is that it is what I lovingly call forced cardio. As I mentioned in my previous blog, I’m far too busy to reliably schedule exercise in my daily life. A few months ago, my boyfriend and I lived on Capitol Hill in Seattle. We were within walking distance of everything. Grocery stores, food, parks, etc. Just about anything we needed was a mile or less away. And, as the name of the neighborhood suggests, every direction we walked was a hill. It was great exercise! Then we upgraded apartments and moved closer to downtown. Now, we’re wonderfully close to Pike Place Market and other downtown goodies…but we are car distance away from our favorite grocery store (Trader Joe’s) and everything else. Long story short – we don’t walk nearly as much. Even if we jaunt down to Pike Place for some fresh produce, it’s less than a mile and flat all the way. Needless to say, a couple weeks after the move, I started to feel sluggish and extra jiggly. So. I would try to get to the cute little gym in our apartment building as often as possible. But working 30+ hours a week at one job, working weekends and some evenings at my other job, squeezing in time for my third job, and attempting to get all the housework, errands, and chores done in between all of that….it was so much that I don’t even know where this sentence began. Basically, I would get to the gym, get a bit of weight lifting in and then hop on a treadmill only to get bored out of my mind in the first 3 minutes. I’d start thinking about all the things I could be productively do instead of moving forward to nowhere. Eventually, I’d convince myself that 15 minutes of cardio was all the workout necessary and I’d be off to get things done. This is more exercise than many Americans get, true, but not enough to constitute a healthy, active lifestyle. And I know what the experts would tell me: “Go outside! Working out is more fun outside!” Let me tell you – I find traditional cardio dreadfully boring no matter where I’m at. In order to be successful at cardio, I need to feel that I’m actively going somewhere and adding to the productivity of my day. So I got the bike! Now, by just leaving a 20 minutes earlier for work and getting home 20 minutes later, I automatically get over an hour of cardio and 10 miles of cycling! It’s like magic!! If you’re like me and you simply cannot fit a steady amount of exercise in your life, please stop berating yourself! I know the exercise gurus keep chastising us for not devoting hours and hours to exercise. But that’s not fair. Some of just do not have extra hours – plain and simple. So here are a few of my own ideas that maybe you can use to add a little extra exercise in your life. Get a bike! Check out if your city is bike friendly. Many cities are these days. I know Boca Raton, Florida is (random, right?). You may very well be living in a bike mecca and not even know it! Even if you live a ways from work, see if your city offers “bike-and-ride” bus programs. In Seattle, for no extra charge, you can rack your bike on the front of a bus, get off at a bus stop closer to work, and bike the rest of the way. Park really really far away. You’ve heard this before, right? We all love to spend precious minutes searching for the closest parking spot. But unless you have a severe problem walking, parking far away is going to do you more good than harm. Carry a hand basket in the grocery store. Now, if you’re shopping for a family of four, this is probably not an option. But if you DO carry a hand basket instead of pushing a cart, you’ll not only get a little strength training into your life…but you’ll also be less likely to load your basket down with not-good-for-you foods. There is only so much room in those baskets! Take the stairs! I don’t mean take 10 flights of stairs. I’m certainly not planning on always taking the stairs up to my 8th floor apartment. Not when there is a perfectly good bank of elevators. However, if you only have one or two floors to go up, is taking the stairs going to kill you? Probably not. More than likely, it is just going to help sculpt a nice backside. Walk wherever you can. Take a look at the places you go most. Is the grocery store only a mile away? The drugstore on the corner? Do you really need to drive to those places? Probably not. And if you’re concerned about carrying groceries home, buy yourself some adorable reusable rolling shopping bags! Just load ’em up and drag ’em behind you. I sincerely hope I, maybe, inspired you to add a little real world exercise to your day. At the very least, I hope I’ve inspired you to stop beating yourself up if you don’t have the time to exercise everyday. There are definitely going to be days when I don’t ride my bike to work. Maybe because I have to get to another job immediately after work or maybe because I just woke up late that day. And that is all okay. Because I’m just doing the best I can for me. And that’s what matters.